Edit: Previously I posted this blog post on incorporating obstacle avoidance, but after a recent comment on the code I started going through it again and found a whole bunch of issues. Enough so that I’ve recoded things and I’m going to repost it now with working examples and a description of the changes I made to get it going. The edited sections will be separated out with these nice horizontal lines. If you’re just looking for the example code, you can find it up on my pydmps repo, here. Alright. 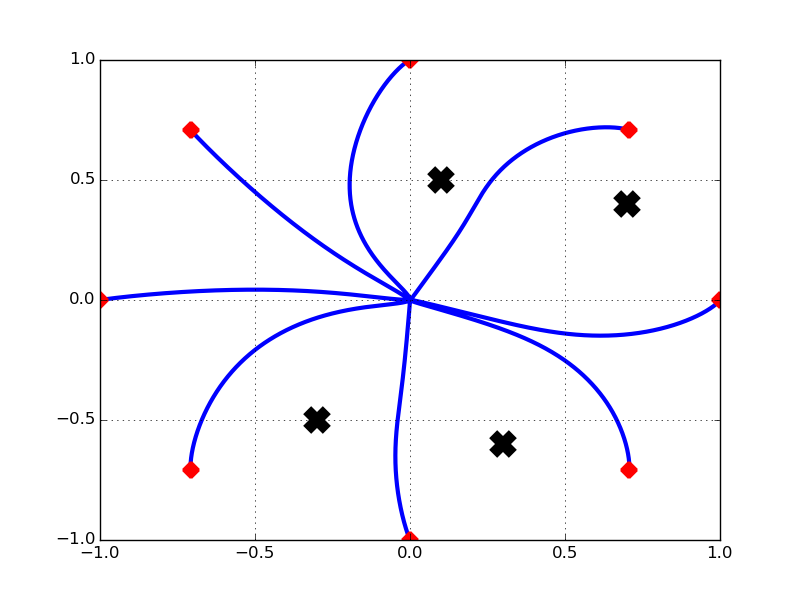 Previously I’d mentioned in one of these posts that DMPs are awesome for generalization and extension, and one of the ways that they can be extended is by incorporating obstacle avoidance dynamics. Recently I wanted to implement these dynamics, and after a bit of finagling I got it working, and so that’s going to be the subject of this post. 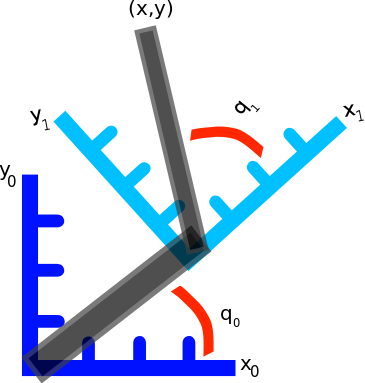 There are a few papers that talk about this, but the one we’re going to use is Biologically-inspired dynamical systems for movement generation: automatic real-time goal adaptation and obstacle avoidance by Hoffmann and others from Stefan Schaal’s lab. This is actually the second paper talking about obstacle avoidance and DMPs, and this is a good chance to stress one of the most important rules of implementing algorithms discussed in papers: collect at least 2-3 papers detailing the algorithm (if possible) before attempting to implement it. There are several reasons for this, the first and most important is that there are likely some typos in the equations of one paper, by comparing across a few papers it’s easier to identify trickier parts, after which thinking through what the correct form should be is usually straightforward. Secondly, often equations are updated with simplified notation or dynamics in later papers, and you can save yourself a lot of headaches in trying to understand them just by reading a later iteration. I recklessly disregarded this advice and started implementation using a single, earlier paper which had a few key typos in the equations and spent a lot of time tracking down the problem. This is just a peril inherent in any paper that doesn’t provide tested code, which is almost all, sadface. where and are gain terms, is the goal state, is the system state, is the system velocity, and is the forcing function. 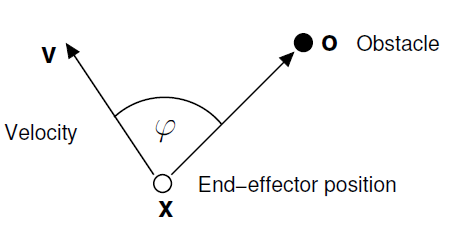 where implements the obstacle avoidance dynamics, and is a function of the DMP state and velocity. Now then, the question is what are these dynamics exactly? where and are constants, which are specified as and in the paper, respectively. Edit: OK this all sounds great, but quickly you run into issues here. The first is how do we calculate ? In the paper I was going off of they used a dot product between the vector and the vector to get the cosine of the angle, and then use np.arccos to get the angle from that. There is a big problem with this here, however, that’s kind of subtle: You will never get a negative angle when you calculate this, which, of course. That’s not how np.arccos works, but it is still what we need so we will be able to tell if we should be turning left or right to avoid this object! So we need to use a different way of calculating the angle, one that tells us if the object is in a + or – angle relative to the way we’re headed. 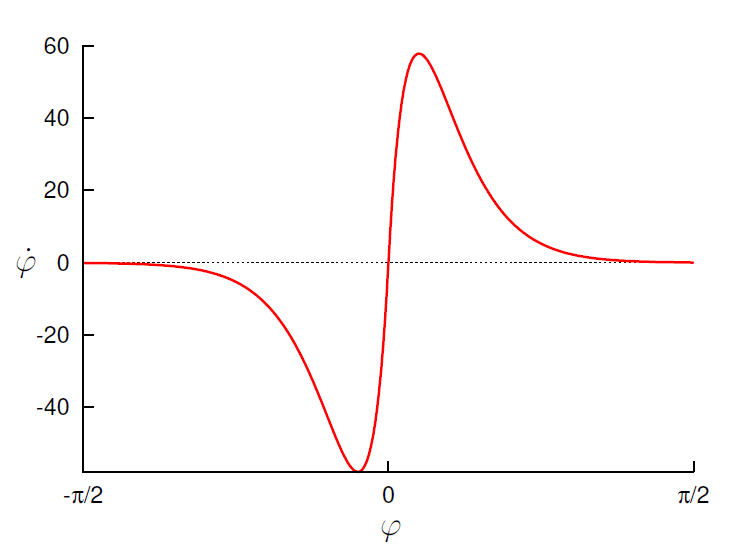 To calculate an angle that will give us + or -, we’re going to use the np.arctan2 function. We want to center things around the way we’re headed, so first we calculate the angle of the direction vector, . Then we create a rotation vector, R_dy to rotate the vector describing the direction of the object. This shifts things around so that if we’re moving straight towards the object it’s at 0 degrees, if we’re headed directly away from it, it’s at 180 degrees, etc. Once we have that vector, nooowwww we can find the angle of the direction of the object and that’s what we’re going to use for phi. Huzzah! where is the axis rotated 90 degrees (the denoting outer product here). The way I’ve been thinking about this is basically taking your velocity vector, , and rotating it 90 degrees. Then we use this rotated vector as a row vector, and weight the top row by the distance between the object and the system along the axis, and the bottom row by the difference along the axis. So in the end we’re calculating the angle that rotates our velocity vector 90 degrees, weighted by distance to the object along each axis. So that whole thing takes into account absolute distance to object along each axis, but that’s not quite enough. We also need to throw in , which looks at the current angle. What this does is basically look at ‘hey are we going to hit this object?’, if you are on course then make a big turn and if you’re not then turn less or not at all. Phew. and that’s what we add in to the system acceleration. And now our DMP can avoid obstacles! How cool is that? Edit: OK, so not suuuper compact. I’ve also added in another couple checks. The big one is “Is this obstacle between us and the target or not?”. So I calculate the Euclidean distance to the goal and the obstacle, and if the obstacle is further away then the goal, set the avoidance signal to zero (performed at the end of the if)! This took care of a few weird errors where you would get a big deviation in the trajectory if it saw an obstacle past the goal, because it was planning on avoiding it, but then was pulled back in to the goal before the obstacle anyways so it was a pointless exercise. The other check added in is just to make sure you only add in obstacle avoidance if the system is actually moving. Finally, I also changed the instead of . And that’s it! Just add this method in to your DMP system and call avoid_obstacles at every timestep, and add it in to your DMP acceleration. So here there’s just a basic attractor system (DMP without a forcing function) trying to move from the center position to 8 targets around the unit circle (which are highlighted in red), and there are 4 obstacles that I’ve thrown onto the field (black x’s). As you can see, the system successfully steers way clear of the obstacles while moving towards the target! We must all use this power wisely. A couple of months ago I gave a talk at the Neuro-Inspired Computational Elements (NICE) workshop, about the use of cortical microcircuits for adaptation in the prediction and control problems. The talk was recorded, and here is a link: http://1.usa.gov/1tg2n2I Ignore the fire alarm that gets pulled in the first minute, the actual talk starts around 1 minute. I’ll be writing up some posts on the subject matter of my talk in the next couple months, explaining the methods in more detail and providing some solid examples with code. Hope you find the video interesting!